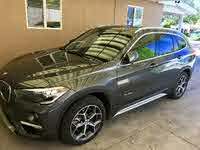 Looking for a New BMW X3 in your area? 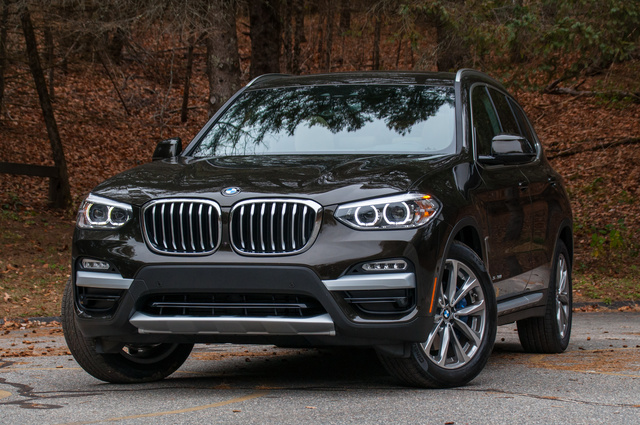 CarGurus has 371 nationwide BMW X3 dealers with 21,785 new car listings. BMW's second most popular crossover gets a complete overhaul for 2018. The South Carolina-built X3 is one of five BMW crossovers on sale. Soon there’ll be seven, progressively stepping up in size and price from X1 to X7. Look closely at the 2018 X3, otherwise you won’t realize this third-generation Bimmer is entirely new. It’s not you. Everyone drives compact crossovers, and every automaker offers one, two, or three. So what makes a BMW stand out? Unlike Mercedes-Benz and Lexus, BMW isn’t taking chances with fresh design. 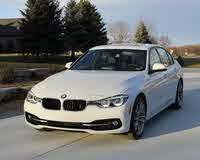 None of BMW’s latest models look dramatically different from their predecessors. They also aren’t polarizing, love-it-or-hate-it cars. They’re handsome, good-looking machines with classic BMW cues, like the four elliptical headlights, twin-kidney grille, minimal surface detailing, and that curved rear side glass seen on BMWs since the 1960s, also known as the Hofmeister Kink. The X3 is conservative, tasteful, and keen on staying relevant for the next decade, instead of chasing the latest fad. For some, that may not be enough. To me, the body’s proportions and detailing--like the silver-painted accents on the bumper and sills--are just right. Our X3’s Dark Olive Metallic paint paired with Canberra Beige Vernasca leather for a brownish/tan combo reminiscent of a caramel-filled Ghirardelli chocolate. The familiar theme continues inside, with BMW’s minimalist instrumentation, driver-canted center stack, and amber-colored gauges. Precision craftsmanship can be found in a Honda, and that’s to be expected in the X3. Multi-color LED ambient lighting that allows two shades at once---one for the upper sections of the doors and dash, another for the lower sections and footwells---are a visual delight. SensaTec vinyl comes standard, and the actual leather isn’t made to be supple. Both upholsteries will hold up to hard use versus the super-soft Nappa or semi-aniline leather in more expensive cars. With the panoramic moonroof and large side glass, the X3 feels airy and decidedly more like a larger SUV. You’ll enjoy stepping inside an X3. You’ll also enjoy hitting the gas and telling passengers, “That’s a 4-cylinder engine.” BMW’s 2.0-liter turbocharged inline four is what it is: Incredible. It sounds good, it pulls hard at all speeds, and it has hardly any of the shaking, buzzing vibrations inherent in small engines of this size. BMW rates the xDrive30i we tested at 248 horsepower and 258 pound-feet of torque, but it sure feels like a couple dozen extra ponies are prancing around under the hood. The ZF-designed 8-speed automatic is essentially flawless. There’s no lurch or hesitation, just smooth shifts that can transition from creamy soft to neck-whipping quick, depending on your selected drive mode (Eco Pro, Comfort, Sport, or Individual) and whether the transmission selector is in S mode. All-wheel drive (AWD) is standard on all X3s. The former rear-wheel-drive (RWD) sDrive28i is no longer available. Neither is the diesel. Minor gripe for 2018: BMW no longer lets you keep the auto stop-start system deactivated, so every time you turn the car on, you’ll have to press the Stop-Start button above the engine Start button. But this being a German car, the base engine is never enough. The xDrive M40i makes M2 levels of power--try 355 hp and 369 lb-ft of torque--from a 3.0-liter turbocharged inline six. It’s not a top-to-bottom overhaul like the X5 M or X6 M, in which BMW’s Motorsports division swaps out every conceivable part on the car. The M40i also brings upgraded brakes, a sport suspension, and a more menacing style. 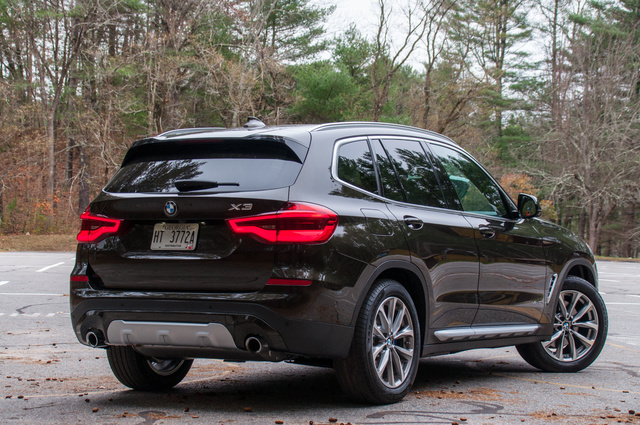 Our X3’s Dynamic Handling Package ($1400) brings much of the M40i’s verve, including adaptive dampers, torque vectoring that brakes the inside rear wheel around turns, bigger M Sport brakes, and variable-effort steering. Objectively, the X3 brakes and handles very competently. And if you’re commuting like most people, the X3’s quiet interior and cushy ride will have you smitten. But like most BMWs these days, the X3 is not a fun car to toss around turns. Tuned for comfort over outright control, the X3 (at least in our 4-cylinder trim) rolls and tosses a little more than the ultimate driving machine would have done a few years ago. Many BMW customers don’t seem to care anymore, but if you’re expecting a BMW to transmit the road surface to your palms, go buy that M2. At least BMW understands that tech-laden cars are still for driving. That means the X3 doesn’t bog its driver down with pretentious graphics, garish displays, and confusing, distracting infotainment systems. The iDrive 6.0 system is logical and fast, plus the central screen is--drum roll, please--a touchscreen! That’s a big deal for a German luxury car, which have until recently never offered touch control. The X3 lets you swipe, tap, and pinch the screen, or do the same thing to the touchpad integrated on the top of the iDrive rotary controller. There are hard buttons surrounding the controller for audio, nav, and other critical functions. It sounds harder than it is. 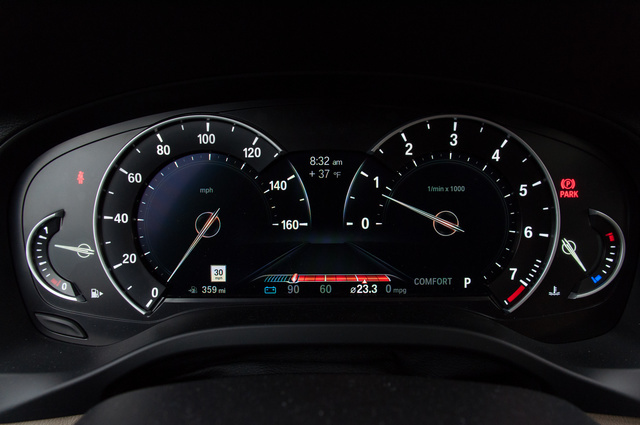 Even the optional digital instrument cluster doesn’t allow any customization other than a slightly different style in Sport mode. While I can’t appreciate the X3 for its sports-car-like handling, I love that it lets me focus my distracted mind on driving. 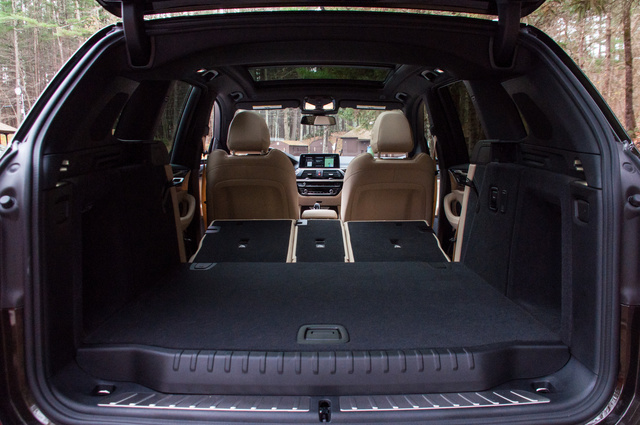 Aside from large, clear type and logical control placement, the X3 has loads of room inside. All four seating positions offer generous head, leg, and shoulder room, though the seat bottoms are flat and not very contouring. Over long drives, these firm chairs are supportive on the back, though a little more cushion wouldn’t hurt. The rear seats can recline, although the 28.7 cubic feet of storage behind them is only average. Fold them down, and cargo space expands to 62.7 cubic feet. 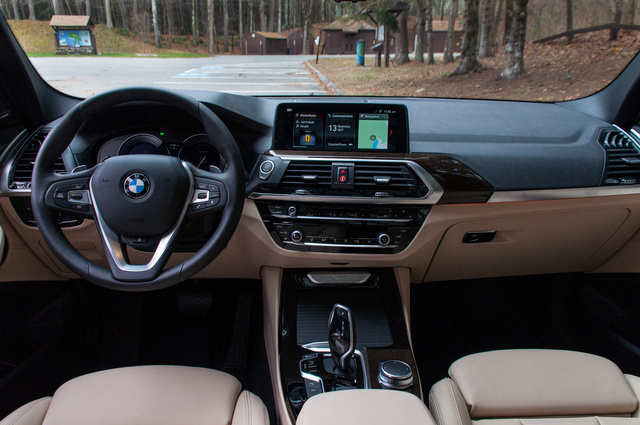 Aside from the latest iDrive interface and touchscreen capability, the X3 throws in a few tricks you won’t find elsewhere. One is the 360-degree camera system that seamlessly blends multiple camera feeds into virtual reality. 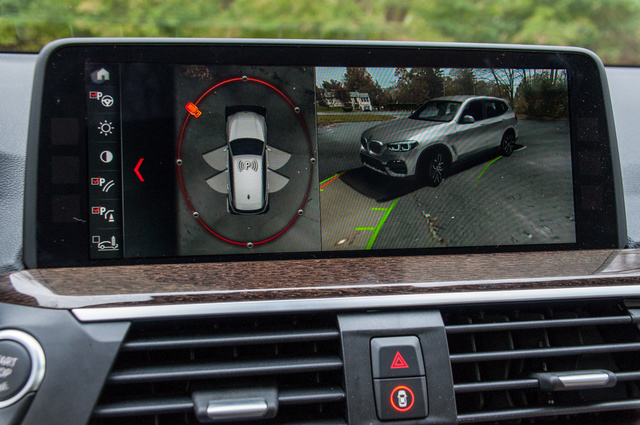 Select individual cameras when reversing or parked, and the main display will show the X3 as it appears outside. It’s literally like you’re walking around the car, without the distortion and blurry edges that plague most 360-degree systems. I used it while waiting for someone at night, so I could see who was behind me and to the sides of the car. Gesture control, which lets you move the cameras with your fingers (and can let you answer calls or raise the stereo volume) is a gimmicky extra that doesn’t always work. In addition to an automatic parking feature, the X3 can switch on its front camera system as you approach another car or a wall. It can also switch on the cameras at a specific GPS location. Should you wish, you can search Flickr photos and navigate to where other Flickr users have tagged them. In-car Wi-Fi, wireless device charging, and Apple CarPlay are pleasant extras, though none are as useful as the factory navigation’s ultra-fast voice dictation and recognition. Within seconds of leaving my home to shoot our CarGurus review video, the X3 recognized my command for a point of interest and revealed the first turn on the head-up display before I reached the end of my street. It’s one of the fastest and most accurate systems available. In the head-up display, you don’t see rudimentary arrows and lines. BMW projects the actual intersection on the windshield. The more you drive an X3 with this technology, the more you’ll wonder why other cars make the simple so complex. The 2018 X3 is still too new to have been rated by the National Highway Traffic Safety Administration (NHTSA) and the Insurance Institute for Highway Safety (IIHS). However, the previous 2017 X3 scored a 5-star NHTSA rating and top scores in all IIHS crash and crash-prevention tests (with only a Marginal for headlight performance, which prevents it from becoming a Top Safety Pick). Driver assists like forward-collision alert, auto braking with pedestrian detection, and adaptive cruise control are only available with two option packages (Driving Assistance and Driving Assistance Plus) for $2600. Our car came equipped with a $900 Driving Assistance package that brings blind-spot monitoring and lane-departure warning. The X3 will not center itself in the lane like vehicles with other semi-autonomous systems. BMW includes other uncommon safety features, such as a pre-collision system that can shut the sunroof, windows, and pre-tension the seat belts if it detects an imminent crash. The car can disable the battery, apply the brakes, and unlock the doors automatically after a crash. The brakes will dry themselves in the rain, and the brake lights will flash rapidly during a panic stop. This is all smart stuff. The X3 isn’t a value, but our $57,620 tester (with destination) came almost fully loaded. Still, the Convenience package ($2800) is a big add for little features like keyless entry, a panoramic moonroof, lumbar support, and SiriusXM radio. It takes the highest “Executive Tier” to gain the bi-LED headlights and the 360-degree camera system. And BMW charges serious bucks for small-time tech, like Wi-Fi ($500) and Apple CarPlay ($300). The X3 starts at $42,450 for the xDrive30i and $54,300 for the xDrive M40i. 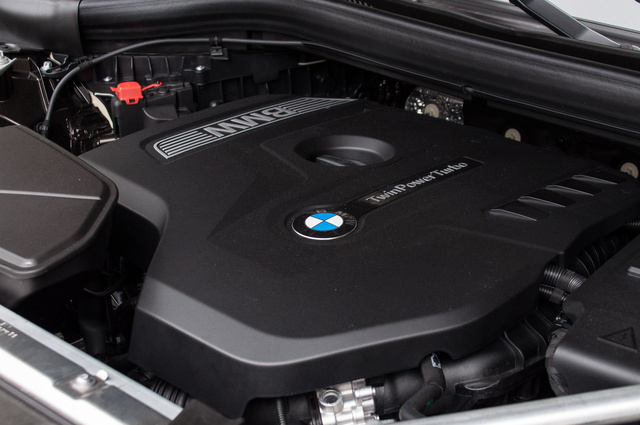 BMW does include three years or 36,000 miles of scheduled maintenance, including oil, brake fluid, air filters, and spark plugs. But smart technology, delivered as well as BMW does it, comes at a price. I’d say the X3 is a worthy buy among luxury crossovers if you can go easy on some of the options. What's your take on the 2018 BMW X3? TheHorror Why not buy a sports car that is a CAR? You don’t like to drive, so much as be a part of the latest fad. Robert I've been driving my 2018 X3 for about nine months. It is highest trim level within the 4-cylinder bi-turbo, 4WD. I love it. Consistently fun to drive, agile, surprisingly spacious, superb fit and finish, and bank-vault quiet. Only complaint, that annoying "defeat auto engine stop" button be pressed every time you start the car, as do all your many custom performance settings. But these are minor-minor flaws in an otherwise outstanding vehicle. Cars like this are why sedans are dying in America. You can have performance *and* practicality...without feeling like a soccer mom. 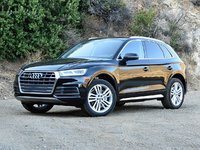 Users ranked 2018 BMW X3 against other cars which they drove/owned. Each ranking was based on 9 categories. Here is the summary of top rankings. 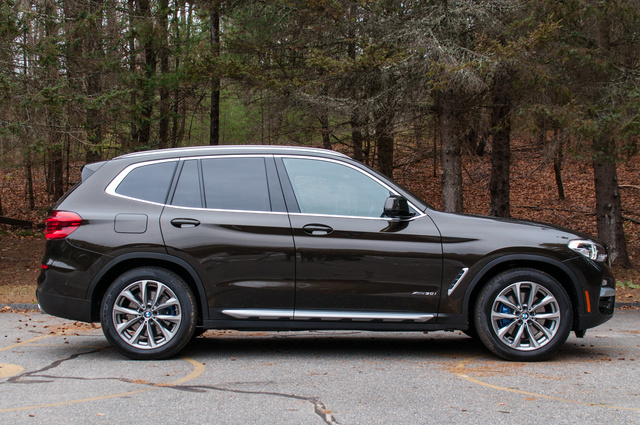 Have you driven a 2018 BMW X3? Enter your zip to see incentives for a new X3 in your area. CarGurus has 18,993 nationwide X3 listings starting at $2,680. How do your change the clock time on the dashboard?